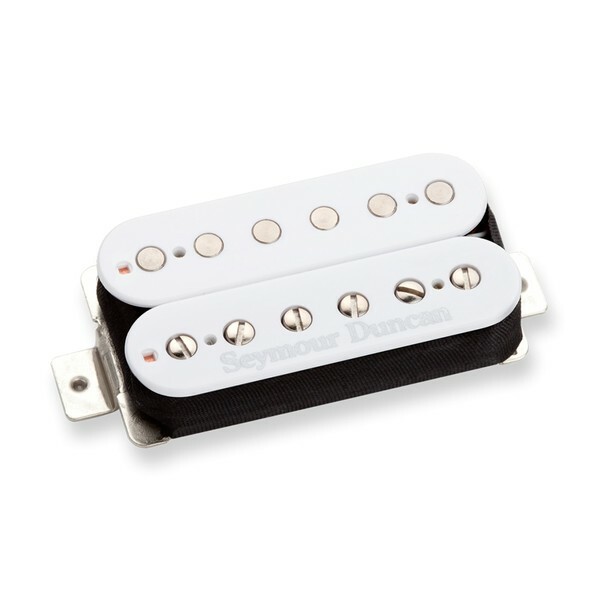 The Seymour Duncan SH-PG1B Pearly Gates pickup in reverse white is a P.A.F styled Humbucker which gives extra midi sizzle that has been dipped in hot sauce. The Pearly Gates pickup projects a tonne of rude Texas attitude but with a beautiful warmth that stays focused and airy. Hand crafted and authentically hand built for that unmissable vintage mojo. Seymour Duncan created a signature sound with the Pearly Gates pickup which captures all the mojo of an original 1959 electric guitar sound and setup. This vintage Humbucker has a unique tonal character, and more of a midi range than the Humbuckers of 1959. The Pearly Gates pickup cuts right through with its stronger well tailored mids, yet still maintaining its open and airy treble attack of the alnico 2 bar magnet. The combination of all the Pearly Gates features along side its spongy, warm low end makes this pickup perfect for playing both rhythm and lead guitar, or try a few harmonics, they really sing with this pickup. Pair with the Pearly Gates neck model for the full drive, Texas experience. Or pair with the Custom Humbucker for a mean sounding, more aggressive rock like setup. Hand crafted and authentically custom built in Santa Barbara, the Pearly Gates model comes with a 4-conductor lead wire for multiple wiring options and is also vacuum wax potted for squeal free performance. Order now and watch sparks fly.